I wonder if my mom still gets upset when I murmur my plans for buying my own place and moving out. I don’t see her teary eyes anymore (knock on wood) when I mention my plans and draw my timeline for buying a house. Is it because she doesn’t love me anymore, or is it for the fact that I’ve slowly occupied her kitchen. Since she still pets me like I’m still her cute little 3-year old, I would say that the latter case is more probable. Right about when I created that timeline for buying my own nest, I started to prepare myself for my own kitchen. The master (aka mom) herself encouraged me into buying them. I started from plates and then moved to baking trays and silicone baking sheets, and then now all of a sudden to kitchen electronics. I mean which self claiming pastry chef can survive without a stand mixer, and all of the attachments that come with it!? And she still supported me, even giving me ideas on where to store them. So slowly our kitchen cabinets have been topped with my new obsessions, and God only help us if we ever had an earthquake in this earthquake prone California of ours! What the master did not foresee was the fact that this self-claiming pastry chef was not going to settle on these equipments sitting on top of the cabinet. So I started using everything I had purchased. And well, when you bake you need a whole bunch of ingredients from your typical butter, flour and sugar to variety of nuts, dried fruits, different types of chocolates and so on. So I crawled into the pantry. And then, I thought that since it’s summer and I have a nice stand mixer with an ice cream maker as an attachment, why not get on an ice cream making marathon, so I packed the refrigerator with heavy creams and half and half which are eventually moving to the freezer in the forms of banana ice cream, raspberry ice cream, mango sorbet and every Iranian’s favorite ice cream, Saffron and pistachio ice cream. (I got so crazy the first week I made 6 different ice creams in a week). My freshly made ice creams are now sitting in tight spots in both of master’s freezers next to the containers of chicken broths I made couple months ago, and the gigantic ice cream freezer bowl which needs to be in the freezer at all times, because God forbid I think of a flavor and my machine is not ready. I made very minor changes to make this dessert Persian. I added a tablespoon of rosewater, 1/4 cup of slivered pistachios, and frozen pieces of cream. I also grounded the saffron instead of using saffron treads. Pour 1/4 of the cream in a thin layer into a flat plate and place it in the freezer until a 1/4-inch frozen creamy crust forms. After the cream got frozen and hard, break the sheet of hardened cream into small pieces, return to freezer. Warm the milk, remaining 1 cup cream, and sugar in a small saucepan. Remove from the heat and add the saffron. Pour into a small bowl and steep in the refrigerator for 4 hours. 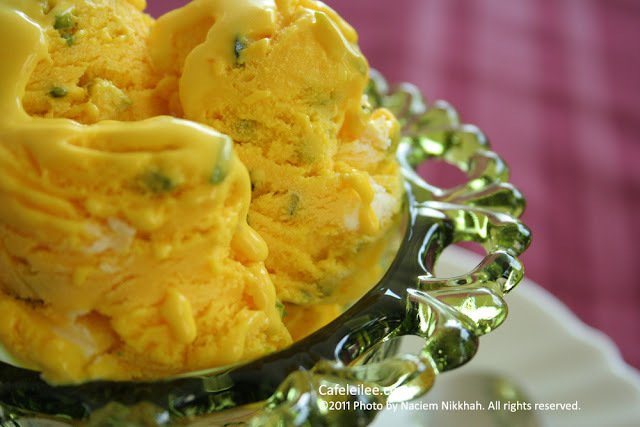 Strain the saffron-infused mixture into a medium saucepan. Rescue the threads of saffron and put them in a medium bowl. Set the strainer over the top. Rewarm the saffron-infused mixture. In a separate medium bowl, whisk together the egg yolks. Slowly pour the warm saffron mixture into the egg yolks, whisking constantly, then scrape the warmed egg yolks back into the saucepan. Stir the mixture constantly over medium heat with a heatproof spatula, scraping the bottom as you stir, until the mixture thickens and coats the spatula (be careful not to boil). Pour the custard through the strainer and stir to incorporate the saffron threads. Stir in the rosewater. Stir until cool over an ice bath. Chill the mixture thoroughly in the refrigerator, then freeze it in your ice cream maker according to the manufacturer's instructions. Be sure to scrape off any saffron threads stuck to the dasher and stir back into the frozen ice cream. 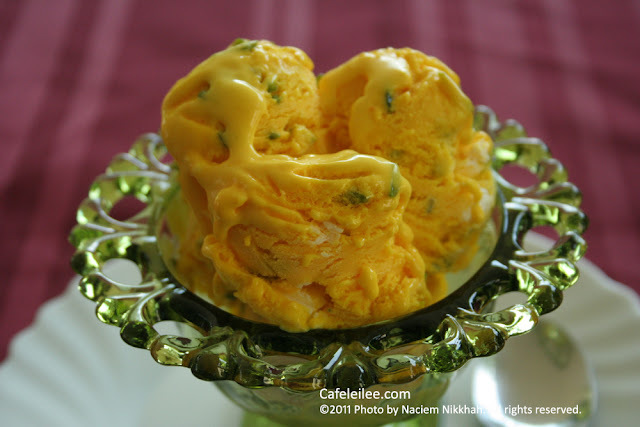 During the last 5 minutes of churning add the toasted pistachio silvers and frozen cream pieces. نمیدونم آیا خانم مادر هنوز هم غصه میخورن وقتی که من برای خرید خانه خویش و کوچ دائمی از خانه گرم پدری برنامه ریزی میکنم یا نه!؟ بزنم به تخته چشمان اشک آلود ایشان را نمیبینم وقتی برنامه هام رو میگم و تاریخ کوچ دائم رو (اگر خدا بخواهد در یکی دو سال آینده) با ذوق فراوان به اطلاع اهل خانه میرسونم. دلیلش یا اینه که ایشون دیگه علاقه ای به فرزند ارشدشون ندارن یا این که این فرزند ارشد دیگه خیلی پرو شدن و دیگه تمام آشپزخانه کد بانو رو اشغال کرده. از اونجایی که خانم مادر هنوز اینجانب رو همچنان لوس میکنند که انگار نه انگار سی سالی از امر ناقابلمون گذشته فکر کنم دومی درست تر باشه. دور و بر همون موقعی که تصمیم گرفتم لونه خودم رو بخرم شروع کردم که به خرید لوازم آشپزخونه. البته خانم مادر خودشون مشوق این خرید ها بودن. جونم براتون بگه از خرید بشقاب شروع شد تا به سینی فر و لوازم شیرینی پزی. حالا هم رسیدیم به لوازم برقی آشپزخانه. البته نه وسایل بزرگ مثل یخچال، وسایل کوچکتر مثل همزن و از اینجور چیزا. حالا همه این وسایل بالای کابینت های آشپزخونه جا خوش کردن که خدا بهمون رحم کنه اگر گوش شیطون کر یک زلزله تو این کالیفرنیای زلزله خیز ما بیاد. خانم مادر فکر اینجا رو دیگه نکرده بود که این دختری که این همه وسایل رو خریده به گذاشتنشون بالای کابینت قناعت نمیکنه و یواش یواش شروع میکنه ازشون استفاده کردن. به همین طریق شیرینی پزی و کیک پزی با وسایل جدید شروع شد و خوب از اونجایی که شیرینی پزی و کیک پزی امروزی دیگه فقط به آرد و کره و شکر بسند نمیکنه، کمد های آشپزخانه کدبانو (همون خانم مادر) با انواع شکلات و ادویه و آجیل مختلف پر شدن. و حالا که هوای این ولایت جدید ما داره یواش یواش گرم میشه بستنی خونگی هم کلی میچسبه اونهم با ماشین بستنی سازی جدیدم. پس یخچال رو با هفت هشت تا قوطی خامه پر کردم که در طول هفته گذشته به شکل ۶ بستنی مختلف از جمله همین بستنی زعفرونی خودمون به فریزر خونه منتقل شدن و جای زرشک و سبزی و همه وسایل به سختی به دست آورده خانم مادر رو تنگ کردن. ۱/۴ پیمانه خامه را در یک سینی کوچک که سطح صافی داره بریزید و توی فریزر بگذارد تا یخ ببندد. بعد از اینکه خامه یخ زد آن را از فریزر خارج کنید و به تیکه های کوچک بشکنید. خامه های شکسته شده را به فریزر برگردانید. شیر را با بقیه خامه و شکر توی یک ظرف لعابی یا استیل روی اجاق گرم کنید زعفران را اضافه کنید و مخلوط را توی یک کاسه بریزید و بگذارد توی یخچال برای ۴ ساعت زعفران دم بکشد. مایه را دوباره به ظرف لعابی یا استیل برگردانید و بگذارد گرم شود. تخم مرغ ها را در یک کاسه خوب بزنید. بعد از مخلوط شیر گرم شده یواش یواش داخل تخم مرغ ها بریزید و تخم مرغ ها را همچنان هم بزنید تا تخم مرغ یک جا نبندد. مخلوط شیر و تخم مرغ را دوباره به قابلمه لعابی برگردانید و با قاشق چوبی روی حرارت ملایم مدام هم بزنید. مواظب باشد تا مایه جوش نیاید و قل نخورد چون در این حالت تخم مرغ و شیر از هم جدا شده و مایه گوله گوله میشود. مخلوط را آنقدر روی اجاق هم بزنید تا مایه کامی سفت شود و پشت قاشق را بگیرد به طوری که اگر یک انگشت از پشت قاشق رد کردید جای انگشت پور نشود. دو کاسه را که یک بزرگ تر از دیگریست آماده کنید. در کاسه بزرگتر کمی آب و یخ بریزید و کاسه کوچکتر رو توی این کاسه بگذارد و روی آنرا یک صافی بگذارید. مایه سفت شده را از صافی رد کنید و اگر زعفرانی به طوری چشبید آنها را نجات دهید و به مایه برگردانید. مایه را در کاسه هم بزنید تا خنک شود. بعد توی یخچال بگذارید کاملا خنک شود. هر وقت مایه کاملا خنک شد در ماشین بستنی سازی طبق دستورالعمل ماشینتون بستنی را آماده کنید. حدود ۵ دقیقه قبل از اینکه بستنی آماده شود خلال پسته و تکه های خامه را اضافه کنید.